Streamsong; perfect golfing terrain...in the middle of Florida! It’s probably enough to tell your friends you’re going golfing in Louisiana. You really need add nothing when you tell them you’re taking a golf trip to Maine or Nebraska, New Mexico, Mississippi, or even Arizona. Of course, each of these states has plenty of courses, and it would be specious to suggest the courses they do possess, no matter how many or how few, all resemble one another. But mention you’re taking your sticks to any of them and whomever you tell is going to have a pretty good picture of where exactly you’re going, as well as the type of course you’ll be playing. Not so Florida. Tell your buddies you’re playing in the Sunshine State and there’s a good chance they’re going to need you to be a little more specific. There are almost 1,500 courses there after all. To help out would-be visitors to Florida, it’s useful to cut the state up into ten, yes ten, distinct golf regions – Orlando, Tampa, Miami, Naples, Sarasota, West Palm Beach, Jacksonville, Dayton and the Space Coast, Gainesville, and the Florida Panhandle. You’ll find an awful lot of the rather mundane, water-strewn, condo-lined courses most people associate with Florida, but you’ll also discover surprising variety. Something you definitely won’t expect to find, however, is an inland links with massive sand dunes, firm and fast-running fairways, large blowout bunkers and exposed sandy areas, some scrubland… and large lakes. You won’t expect to find this because nowhere else in the known universe does this combination of natural features exist on a golf course. Yet this is exactly what you’ll encounter at the Streamsong Resort in the city of Bowling Green (population 2,986). And when we say ‘in’ the city of Bowling Green, we mean at least a couple of miles away as the Boat-Tailed Grackle (fairly common to these parts) flies. A lot was written about Streamsong when it opened in January, but it’s worth bringing up again because the resort’s 216-bedroom Lodge currently being constructed about a mile from the clubhouse should be complete by November and ready to receive guests in early 2014. Rooms will no doubt go quickly during winter, so it can’t hurt to make an early reservation. 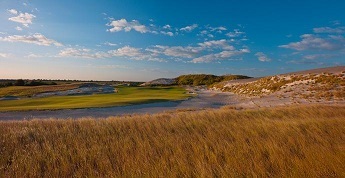 Whatever you’ve read about Streamsong’s Ben Crenshaw and Bill Coore-designed Red Course and the Tom Doak-designed Blue Course is probably true…well, provided you’ve read that both are magnificent tests of golf and definitely worthy of a plane ride from any airport in the USA (including Honolulu and Anchorage), and indeed overseas. It has to be said though, Streamsong is not ideally situated for a multi-course golf trip as the nearest 18-holer is probably the 5,470-yard Reservation Course in Mulberry (population 3,817) 20 miles away and the nearest top-quality venue is the Copperhead Course at the Innisbrook Resort some 75 miles away. But that doesn’t matter at all. Because Streamsong is so good, it raises the number of golf regions in Florida to eleven by itself.